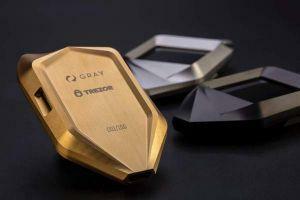 SatoshiLabs, the company behind hardware manufacturer Trezor, has teamed up with manufacturer and designer brand GRAY to release a luxury hardware wallet called Corazon. The cheapest option, Corazon Titanium, goes for USD 695, while the others are much more expensive: Corazon Stealth is USD 994 and Corazon Gold will sell for a whopping USD 1,494. The GRAY luxury brand, founded and based in Singapore, has previously worked on Zyra and Alter Ego collections for Apple devices, among others. Interestingly, the Corazon Gold costs more than the iPhone XS Max 512GB smartphone, which goes for USD 1,449. Meanwhile, the most expensive device from Ledger costs USD 319, while KeepKey costs USD 129. 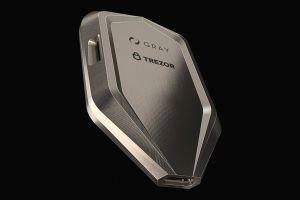 Also, until now, the most expensive device from Trezor was retailed for USD 690. Corazon technology is based on the Trezor Core Firmware of the Trezor Model T.
One of the key aspects of these devices is that all of them have been made out of aerospace grade 5 Titanium, which is a material used in aeronautics as well as in Formula 1 and is 2.5 times stronger than stainless steel, but only weighs half its weight, according to GRAY. Moreover, the wallet comes with a tamper-proof design which should make it safe from external threats. The major difference between the three is the kind of coating they come with. While the Corazon Titanium comes with just the basic Titanium shell, the “Stealth” variant comes out with a black PVD (physical vapor deposition) coating, while the gold variant comes with a gold PVD coating - giving it a more premium look. Only 500 Corazon Stealth devices will be available for purchase, while Corazon Gold is even rarer at only 100 available pieces. In either case, cryptocurrency proponents can already pre-order the Corazon models with either Bitcoin or Bitcoin Cash via Bitpay, and the website takes traditional credit cards as well. Corazon wallets have been created to commemorate the 10th anniversary of Bitcoin. Meanwhile, Marek Palatinus, the CEO of SatoshiLabs told Cryptonews.com in December that the company is working on Lightning Network and Liquid support in Trezor. "Furthermore, we are working on allowing the usage of SD cards with Trezor Model T to protect the encrypted passwords and files of our users. Additionally, security innovations are coming for those who want more - recovery seed splitting for additional safety of funds," he added. 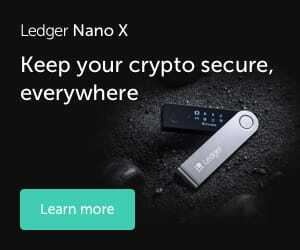 As reported in January, Ledger has launched its next generation hardware wallet Ledger Nano X, that comes with support for mobile devices, while replacing the old micro USB cable that was necessary to plug in to validate transactions, with a wireless Bluetooth connection.